This is a beautifully subtle release based on gristle harsh low end electronics and drifting tones that occasionally soar, occasionally obliterated by a purring of sound and electronic blips, overseen with pure Industrial sonic patterns that wouldn’t be out of place on some of the releases coming from the ‘Mego’ stable. 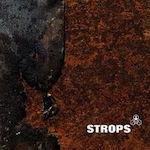 It’s a warm heartfelt sludge in part, something that dirges along in the background giving it a wonderfully homely feel for want of a better word; there is nothing cold about ‘Strops’, which is a relatively new and invigorating experience for me when encountering music from within this genre. Blissfully odd in places, careful attention has been paid to not over playing the lightly off balance areas of sound taking the Industrial overview into areas that wouldn’t be too out of place on a ‘Fennesz’ record or even those that filter through from the likes of sound sculptors ‘Pan-Sonic’ playing in Haus Arafna’s backyard; Its’ the variation and genre crossing here that is the key to this being a cracking album. There is something remarkably fresh about this act, from within its rich drone landscape comes the pulsating humming of a swarm on the move and in its simplicity manages to essentially hold the listener, refusing to follow convention and ultimately coming out on top because of its blatant refusal to follow the masses within an already overcrowded scene.